The Oxford Centre for Spiritual Growth (OCSG) offers a variety of approaches and events that will appeal to a wide range of people, encouraging growth in reflective practice and heightened awareness of God, others and themselves. 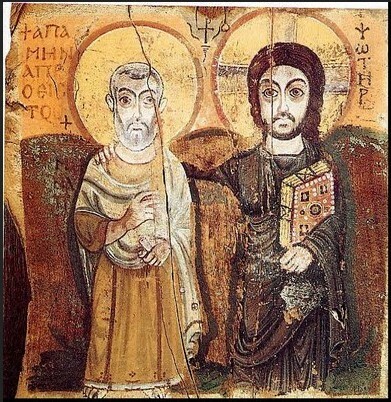 Our iconic image shows Christ (on the right) with a friendly hand on the shoulder of Abbot Mena. It comes from an 8th Century painting on wood, found at the remains of the Monastery of Bawit in Middle Egypt. It is held at the Louvre, in the Dept of Egyptian Antiquities. OCSG is based in the Tower Room in The Church of St Michael at the North Gate, a room at the base of the Tower, which is reputed to be the oldest building in Oxford. It was from St Michael's tower that in 1555, Archbishop Cranmer, who was later to receive the same treatment, watched Bishops Ridley and Latimer burn to death. Their execution took place outside the medieval city walls in what is now Broad Street. A summary of our forthcoming events is given below, together with a record of past events we have held. For more information (such as event times etc), and to register your interest, or to download a booking form, please click the event name. In conjunction with Oxford Quakers 'Only the Song' is an evening of Poetry, led by Professor Mark S Burrows. Given the evening before our Study Day on Meister Eckhart, it will include the works of Rainer Maria Rilke, the Bohemian-Austrian poet, and others. For further details please see [ Poster ]. Booking for this event is essential, and is being managed via Oxford Quakers. at The Quaker Meeeting House, 43 St Giles, Oxford. the Meeting House grounds, weather permitting. This event is now fully booked (19/03/19). A practical day including guided meditations.. This event will take the form of a group of about 20 people, in the quiet setting of the Church. Tea, coffee and biscuits will be provided; please bring a packed lunch.